Blepharoplasty (eyelid reshaping), brow lift, facelift, neck lift, rhinoplasty (nose reshaping), genioplasty (chin correction), pinnaplasty (prominent ear correction), fat injections to the face, breast augmentation (enlargement), breast reduction, breast uplift, abdominoplasty (tummy tuck), arm reduction (brachioplasty), body contouring, liposuction. Head and neck cancer and reconstruction, facial re-animation, skin cancer. Music, theatre, films, scuba diving, sports, travelling, trivia. 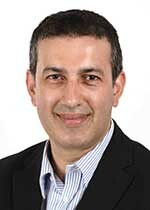 Mr Ahmed is regularly involved in clinical research, and has more than 30 publications and book chapters to his name. Mr Omar Ahmed does not hold a share or financial interest in this hospital, another Nuffield Health hospital or the company. Mr Omar Ahmed does not have a share or financial interest in equipment used at this hospital or another Nuffield Health hospital. Mr Omar Ahmed does not hold any paid advisory role(s) at this hospital or on behalf of Nuffield Health.